John F. Ward, MD, FACS is a clinical scientist with exclusive focus on the management of prostate and testicular cancers. He is recognized as one of the early thought leaders in the prostate cancer imaging and focal therapy. His contributions laid the groundwork that has helped this approach gain recognition as an acceptable therapeutic strategy for select patients with prostate cancer. He helped develop ablative techniques using variety of energy and imaging techniques including the early studies of interstitial laser ablation, focal cryotherapy and high-intensity focused ultrasound; the later work leading to the FDA US approval. He is equally involved in development of urine and blood biomarkers of prostate cancer and now image guided targeted prostate biopsy. 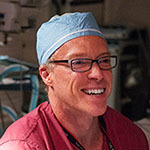 As a busy clinician, Dr. Ward not only pioneered the MD Anderson Cancer Center Prostate cancer imaging and focal therapy program while performing 200+ robotic assisted prostatectomies a year, but he also developed the MD Anderson technique of robotic retroperitoneal lymph node dissection and has now expanded this surgery into both the post-chemotherapy setting and as primary treatment for metastatic seminoma. A native of Pittsburgh, Pennsylvania, Dr. Ward is a Graduate of the University of Notre Dame and Georgetown Medical School. He received his urologic oncology training at the Mayo Clinic, Rochester, Minnesota before completing a career with the US Navy. He joined the faculty at M.D. Anderson Cancer Center in 2006. Prostatectomy: What is the Future? 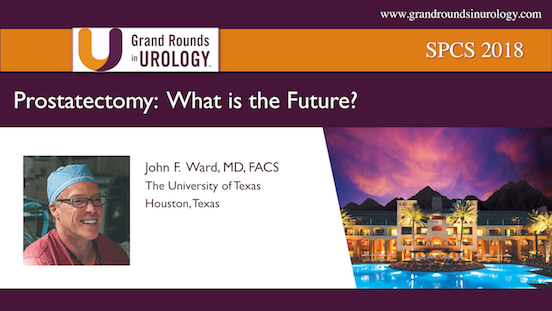 John F. Ward, MD, FACS discusses patient selection in definitive prostate cancer treatment and avoiding over and undertreatment. He then analyzes the impact of the evolving United States Preventive Services Task Force (USPSTF) recommendations for PSA screening on prostate cancer incidence, over and undertreatment, and amount of biopsies performed in urologic practice. John F. Ward, MD, FACS, analyzes the evolution of organ preservation and focal therapy in the past fifteen years, from a random systematic biopsy approach to the introduction of multiparametric MRI (mpMRI) imaging. He then discusses the possibility of using focal cryotherapy as part of a multimodal strategy with immunotherapy.